Beguile your evenings away with a clutch that's eye-catching. This half moon shaped hard case clutch is like a small treasure chest, adorned with Crystals and metal work that's as romantic as you are mysterious. 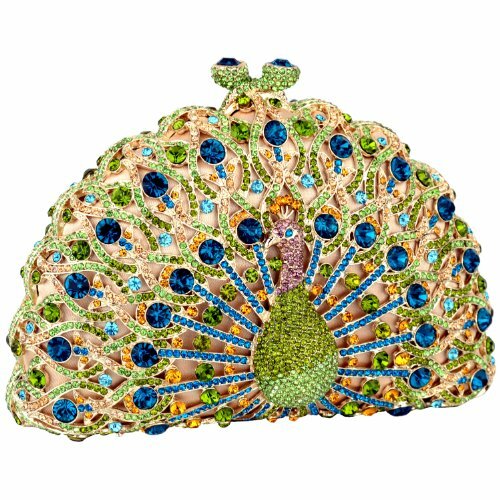 All eyes will be on you when you add the sparkle and glamor of this gorgeous peacock purse's crystals to your ensemble. This exquisite evening handbag adds both style and sophistication to your special-event look with an intricate peacock design studded with hundreds of real, sparkling crystals in shades of blue, green, yellow, and pink. While you're turning heads and this dazzling hard case clutch is catching the light, the surprisingly spacious interior of this mini bag will keep your essential items (like makeup, tissues, and identification cards) by your side. On the top of this Rhinestone evening bag, 2 strong magnets hold the top closure tightly shut, while 2 blue crystal-studded knobs allow you to open the handbag whenever you need to. And if the fun of your special evening means it would be easier for you to go hands free, just clip on the gold-tone chain strap and you're ready to party. This conspicuous design even carries on back side of the handbag. An accessory with sparkle, style, and pizzazz for that prom, wedding, or cocktail party, this iridescent crystal peacock fashion cocktail bag is the way to go. Pair it with the season's hottest hues and all your sultry evening wears. It makes the perfect statement with shifts and sheaths. Dazzling clutch purse features a peacock design studded with sparkling crystals in shades of blue, yellow, green, and pink set on a background of shimmering gold cloth. Exquisite mini evening bag is held closed with 2 sets of magnets that adorned blue-tone Rhinestone kiss clasp. A sparkling gold-tone chain can be clipped onto this evening purse when needed to transform it from a clutch to a small handbag. If you have any questions about this product by MG Collection, contact us by completing and submitting the form below. If you are looking for a specif part number, please include it with your message.